This article is about the district. For the constituency, see East Devon (UK Parliament constituency). East Devon is a local government district in Devon, England. Its council has been based in Honiton since February 2019, and the largest town is Exmouth (with a population of 34,432 at the time of the 2011 census). The district was formed on 1 April 1974 by the merger of the borough of Honiton with the urban districts of Budleigh Salterton, Exmouth, Ottery St. Mary, Seaton, Sidmouth along with Axminster Rural District, Honiton Rural District and part of St Thomas Rural District. East Devon is covered by two Parliamentary constituencies, East Devon and Tiverton and Honiton. Both were retained in the 2010 general election by the Conservative Party, and are represented by Sir Hugo Swire and Neil Parish respectively. In the 2001 census it was found that a third of East Devon's population were over 60. The average for England was 24%. East Devon also had a higher number of people living in "Medical and Care Establishments" at 1.6% compared to the England average of 0.9%. The council area covers the area of Devon furthest to east, stretching all the way from Exeter to the county border with Dorset and Somerset. A large amount of East Devon is made up of two Areas of Outstanding Natural Beauty (AONB), East Devon AONB and the Blackdown Hills. AONBs have the same level of protection as National parks of England and Wales which restricts new developments, which protects the natural beauty of this district. The entire East Devon coastline from Exmouth to the border with Dorset is part of the designated World Heritage Site called the Jurassic Coast; the designated area itself continues up to Old Harry Rocks near Swanage. 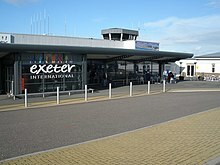 Exeter International Airport is located in East Devon. A small stretch of the M5 passes through the district. The head office of Flybe is in the Jack Walker House on the grounds of Exeter Airport. ^ "Councillors - East Devon". East Devon. Retrieved 2016-07-22. ^ "Contact Us." Flybe. Retrieved on 29 August 2009. Wikimedia Commons has media related to East Devon. This page was last edited on 4 March 2019, at 11:26 (UTC).